Krazy Krouse Kids: And You Wonder? Wonder where these Krazy Krouse Kids get it from? 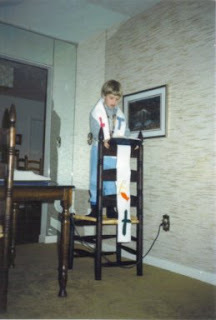 Here's a recently discovered photo of Daddy at age 6--taken in May 1986--preaching in the living room. Notice the stole? He made it in Sunday School Class!!! Daddy is krazy, but he's going to be a preacher-man.